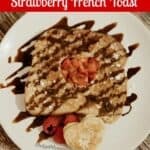 If you are wanting an AMAZING breakfast or breakfast for dinner recipe then this Chocolate Covered Strawberry French Toast is one you are going to love! The other night my husband had to work late and since my daughter is very used to him being home for dinner, she was upset. 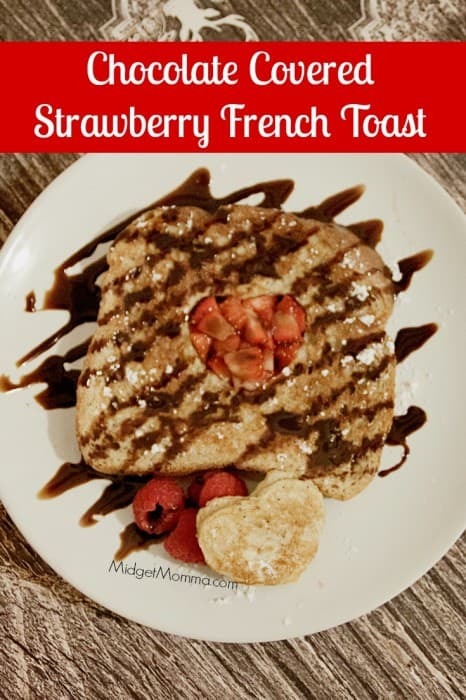 I decided to make a extra special breakfast for dinner to help cheer her up and I came up with these Chocolate Covered Strawberry French Toast . She loved being able to use the cookie cutters to make a heart in her french toast. What made it even better was being able to fill that heart with strawberries, the chocolate drizzled on the top added that amazing chocolate covered strawberry flavor. I found the heart cookie cutters here or you can find them in your local stores. Heat up your griddle to medium head and coat with a small amount of pan spray. Chop up your strawberries and place them in a small bowl with the sugar, stir then set aside. In a pie plate mix the eggs, milk, cinnamon and vanilla together with a whisk. Using a medium heart cookie cutter, cut out a heart in the middle of each slice of bread. Dip your bread into the egg mixture and place on your griddle. Cook until each side is golden brown and then flip to cook the other side. Continue doing the same until all your french toast is made. Place your toast on the plates and fill each heart with the strawberries. Place a few raspberries and the heart piece of french toast on the side of the other toast. 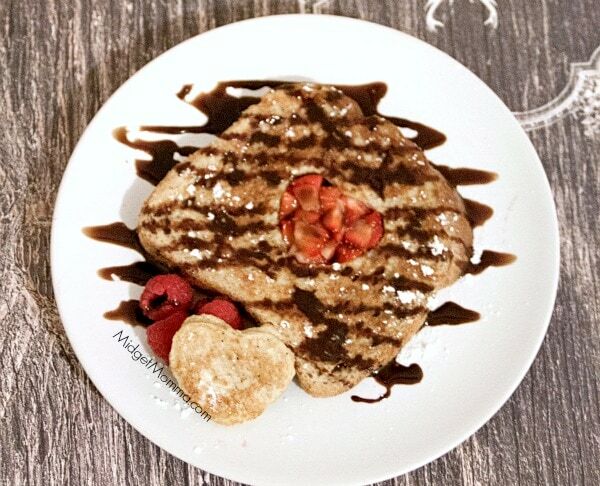 Drizzle the french toast with powdered sugar and chocolate syrup.